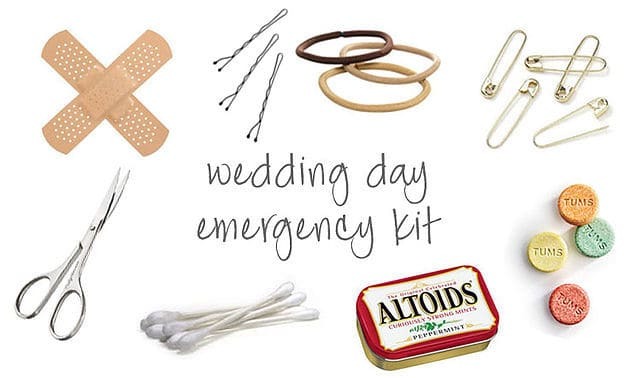 Who would’ve thought that you needed an emergency kit on your wedding day? Well, just like any other important day, it is best to be prepared and ready for any accidents that may happen. If you have a wedding planner they normally have a lot of these on them already! Listed below are items that you will not regret having with you on your wedding day. Not only will it save you stress and time when accidents do occur, but it will also make you more comfortable knowing that you are prepared for any type of mishap. 1. Stain Remover Pen: Just in case you get a stain on your beautiful wedding dress, having this will remove it quickly and efficiently! 2. Super Glue: You always want to have super glue on hand just in case something minor breaks. For example, a piece of jewelry or even an accessory might break while getting ready. 3. Breath mints: Let’s say that you had Panera for lunch on your wedding day and the taste has not left your mouth, even 30 minutes before your ceremony is about to start. Having breath mints wouldn’t be such a bad idea, especially for you soon-to-be husband when he is asked to kiss the bride! 4. Petty Cash: If something unexpected requires you to spend money, such as extra favors or extended party time, you will be able cover it quickly! 5. Ibuprofen: You never know what random pains you might get on your wedding day. Keeping your preferred medication reachable will be handy to alleviate pains that might make you a little cranky. 6. Bobby Pins: Of course, everyone needs bobby pins for flying hairs! 7. Mini First-Aid Kit: Swooshing, people running around, and little kids getting into everything could cause a minor scratch. A first-aid kit with Band-Aids and antiseptic wipes is definitely a necessity. 8. Tissues: Tissues are for multi-purpose uses. They can be used to clean up tiny stains, for fixing makeup, wiping hands, or even wiping away happy tears. It’s always good to have them! 9. Lint Roller: The name explains it all. Having a lint roller will get rid of the fuzz that might make your outfits, or anyone else’s, look unpolished. 10. Snacks: With trying to make sure everything runs as planned, keep a snack in this kit. You wouldn’t want anybody feeling ill while walking down the aisle or dancing on the dance floor. 12. Small Sewing Kit: This small sewing kit will save you from those minor rips or tears in your clothing. Keeping one close by will cut the stress if an accident does happen. 13. Pen and Paper: These seem like odd items, but you would be surprised at how much you might need them. You can use them to write last minute cards to your bridal party, to jot down notes and/or phone numbers, or to sign specific documents. 14. 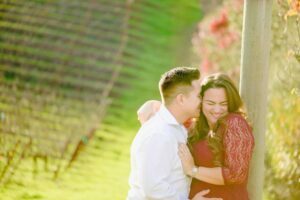 Deodorant: Since your wedding day might be one of the most important days of you life, you might feel nervous or stressed at times, causing you to sweat. Keeping a stick of deodorant with you will keep you smelling fresh and clean, despite the butterflies in your stomach. 15. Back-up Makeup: If your makeup gets ruined or fades away after your makeup artist has left, having your own back up makeup will allow you or someone else to help you touch it up. 16. Makeup Remover: Along with the makeup, makeup remover is needed when retouching or wiping away stains. 17. Bottled Water: Dehydration is not an option. Remind yourself to drink water as it is most likely going to be a long day! 18. Mini toothbrush: If you have anything stuck in your teeth after eating breakfast or lunch, you can brush your teeth with your mini toothbrush! 19. Mini toothpaste: Of course we can’t forget, you need toothpaste as well to brush your teeth. 20. Feminine Products: It’s always better to be ready for what Mother Nature has to bring on your special day.